Whether you’re a homeowner, business owner, or property manager, at some point you will probably need to call a plumber. It’s a good idea to do a little research into the world of plumbing before you call someone and turn them loose on your plumbing system. A good plumber can save your bacon. A bad plumber can be your worst nightmare in terms of issues that keep coming back to bite you. Got a few minutes? Get comfortable, read through our few thoughts, and see if you feel a little bit better about finding a plumber by the end of this article. Word of mouth is the most trustworthy way to find a reputable plumber. Ask your neighbors and local family and friends. You know they’re not going to recommend some yahoo that ripped them off or did substandard work. No, they’re going to tell you the truth. This guy or that guy did this or that and charged this much or that much. 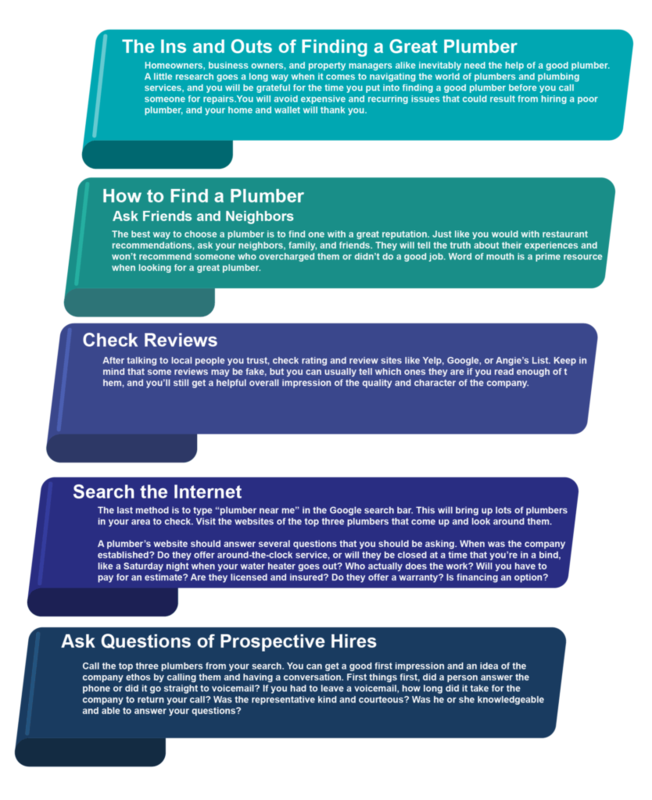 Word of mouth is a great way to find a great plumber. After that, check out the review and rating sites—like Angie’s List or Yelp or Google. You can’t totally trust the online reviews, but if you read enough of them you can spot the fakes and come away with a pretty good bead on the integrity and performance of the company. Finally, go online and search for “plumber near me.” That search will bring up a bunch of plumbers and now your research has begun afresh. You’ll want to check out at least the top three plumbers by going to their websites and having a look-see at what they’re about. Ask yourself questions and look on their websites for the answers. How long have they been in business? Who does the work? Are they licensed and insured? Do they have 24/7 service or are they closed on the weekends when your water heater might go out? Do they offer free estimates? Is their work warrantied? Do they offer to finance? We recommend coming up with a list of three plumbers and then calling all of them. Get an idea of the company ethos in your first-contact conversation. First, did a live body answer your call or did it go to voicemail? If it went to voicemail, how long did it take to get a return call? Was the company representative friendly? Courteous? Did you get knowledgeable answers to your questions? Based on your conversations with the three candidate plumbing companies, you can select one to come out and give you an estimate. Keep in mind that an estimate visit does not obligate you to go with that company. If the plumber that comes out gives you the heebie-jeebies or seems fly-by-night, call out the next company. You’re looking for a company that you can put on speed dial for any plumbing issue, so it needs to be a company of people that you have a good, solid feeling about. Once you’ve gotten to this point, you can make a decision about the plumber and move forward with hiring him or her to do a project. Consider starting with a job that’s less involved than, say, repiping the entire house. Start with a faucet replacement or the repair of a leaky toilet. See how the plumber does on this smaller job. Look at all aspects of the hire, from communication to scheduling to timely arrival to job execution to clean-up to billing to follow-up. If it feels like you’re going over the top in your analysis, remember that you’re looking for a company you can call back for as long as you own that property. You want to develop a relationship with this company and know that you can depend on them for any and all plumbing issues. It’s ok to be a little retentive at the start! We’ve outlined the process we recommend for finding a good plumber. Now let’s look at the services a good plumber should provide. It’s a good idea to find a plumber that offers a comprehensive array of plumbing services. Remember you want a one-stop shop—that is, one company you can call for your various plumbing needs. Did you know that it’s plumbers who install water heaters, and repair and maintain them? Water heaters are those appliances that are usually tucked away in a closet or a garage, forgotten about until they go out. At that point, when you’re standing in a freezing-cold shower, you remember that your water heater exists and now needs some sort of resuscitation. Then commences the online search for the plumber—unless, of course, you’ve already got that plumber on speed-dial because you’ve done your research and all those other things we suggested earlier. Plumbers will be able to fix your water heater. If they find that it has reached the end of its good life and needs to be replaced, they will have new water heaters in stock that they can install expeditiously. And then you can finish your shower. Have you heard of tankless water heaters? These units utilize internal coils instead of large storage tanks. Consider replacing your standard water heater with a tankless water heater when the time is right. A clogged or backed up drain pipe is a problem. Sometimes a homeowner can unclog a drain with a commercial product or with a plunger. Sometimes unclogging a drain takes disassembling the plug and putting a hook down to pull out hair and gunk. And sometimes even then nothing gets that drain cleared, not even standing on one’s head and muttering incantations to the drain gods. A professional plumber can make it all right. He or she has the right equipment, including high-pressure jets, to locate the clogs and clear the pipes, allowing the free flow of water again. Leak detection is definitely not a do-it-yourself project since it involves specialized equipment. A good plumber will have an electronic leak detection machine. This instrument can differentiate between soundwaves produced by leaking pipes and soundwaves produced by non-leaking pipes. Other factors make soundwaves occur differently: leaks under pressure, thickness of the pipes, and what fluids are in the pipes. A component in the leak detection machine receives the sounds and directs them to an amplifier. Amplification allows for the sounds to be analyzed and interpreted, which is how leaks can be understood and addressed. Proper equipment combined with experience gives a plumber the ability to detect leaks in water supply systems, pipes and toilets, drains, steams pipes, oil pipes, and more. Identifying and fixing a leak can prevent damage and expensive repairs. Plumbers are the people to call when you have sewer or water line problems. These lines are vulnerable to damage or compromised function because of debris that washes in or penetration by tree roots. The fact that these lines are sometimes buried can make it hard to know what the problem is. As soon as you suspect a problem with your sewer or water lines, call a plumber. A break or a blockage can result in damages that are expensive to repair so time is of the essence. Annual inspections of these systems ensure that they perform at maximum capacity and that vulnerable areas are fixed or reinforced. A plumber inspecting sewer lines and water lines will be able to see breaks, cracks, collapsed pipes, blockages, off-grade piping, leaks, corrosion, bellied pipes, and tree root infiltration. What causes blockages? It varies depending on the location of the lines. Blockages can come from cooking substances such as grease and fat; cleaning products such as soap and detergents; hair, toothpaste, and personal products; paper products such as toilet tissue; oils and chemicals that go down floor drains; leaves and dirt in downspout drains; and tree roots and dirt in underground pipes. Plumbers have all the equipment necessary to unclog all types of drains, water pipes, and sewer lines. What is repiping? Essentially, it’s replacing old pipes with new pipes. Over time, the pipe system in a house or building deteriorates. Repairs keep it functioning but sometimes there comes a point when the whole system needs to be replaced. A plumber understands that different types of pipes are required to properly repipe a house or building. For example, there may be copper piping, which is typically found in water supply lines to sinks and toilets. There may be PEX tubing, which is a durable and flexible kind of pipe that withstands freezing temperatures. And there may be PVC piping found in vents, water lines, and drain pipes. Your plumbing contractor should complete a repiping project with some combination of the above pipes. Plumbers are now able to make use of video technology to view inside sewer and water lines. A tiny camera affixed to a cable is inserted into a line or a pipe and sends video footage to the plumber. This tool can be invaluable in diagnosing problems and helping a plumber plan repairs. Video footage is also helpful in confirming that blockages have been cleared away and the pipe or line is clear. Plumbers often offer water conditioning and water softening services. These can be very valuable, especially for home- and business owners in areas with iron or sulfur in the water. Whole-house softener and filtration systems provide soft, treated water throughout the entire house. Point-of-use systems provide soft, treated water in targeted fixtures. If you have read this whole article, you deserve an entire chocolate pie! Kidding aside, with the information you have read here, you now know the scope of services that a better plumber provides. You also know how to go about finding that better plumber. Here’s to you finding the perfect plumbing contractor that will serve you well for years to come. Call Baker Brothers Plumbing for the fastest and most reliable plumbers for your home or business.